Markets rallied for the third week in a row, sending stocks to new all-time highs on the back of a strong May jobs report.For the week, the S&P 500 rose 1.34%, the Dow gained 1.24%, and the Nasdaq grew 1.86%. Markets shot up on Friday after a better-than-expected jobs report showed slow and steady improvement in the labor market.Here are some high level takeaways: The economy gained 217,000 new jobs in May, many in business services and healthcare, indicating that the quality of available jobs may also be improving. Though headline unemployment is unchanged at 6.3%, digging deeper, we can see that the number of people who can't find full-time jobs has fallen, as has the number who are forced to work part-time for lack of better options. This is great news for the labor market. We also want to point out an important milestone reached last month: The economy has regained all of the jobs lost in the recession. 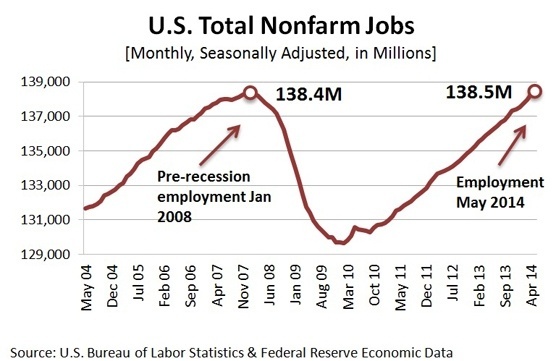 The chart below shows that total nonfarm employment in the U.S. reached 138.5 million in May, up 8.8 million since the bottom of the recession in 2010. While this is a noteworthy event, when we consider population growth and labor force growth, employment is still below healthy levels and the labor market still has a ways to go. The European Central Bank voted to adopt aggressive measures to prop up Europe's lagging economy. Though the ECB hasn't quite reached Federal Reserve-style quantitative easing measures, it cut interest rates below zero, charging banks for holding money overnight. Economists hope the move will force banks to lend money out rather than pay to keep it on deposit, increasing the availability of credit to businesses and staving off deflation. Reactions to the move were mixed, with some analysts applauding the move, while others worried about the possible effects on savers. Regardless of the outcome, it will likely take several quarters to see any effects of the new lower interest rates. The week ahead is thin on economic data, but investors will be looking at Friday's consumer sentiment report to see if Americans have regained their optimism after a weak showing in mid-May. Since consumer spending accounts for about two-thirds of economic growth, consumer attitudes play an important part in economic forecasts and short-term market movements. Retail sales will also be in focus on Thursday. Student loan debt behind housing stall? A former Federal Housing Administration head blames crushing student debt loads for delayed household formation and lackluster home sales. Higher housing prices in desirable urban areas may also make it challenging for first-time homebuyers to purchases homes. Consumer credit use rises. Americans ramped up their use of credit cards in April, pushing consumer credit growth to its fastest pace in nearly three years. Credit card use is up to its highest annual rate since November 2001. Higher use of credit is a potentially positive sign for consumer spending. Factory orders rise. Orders to American factories rose in April for the third straight month, adding to the growing pile of evidence that suggests U.S. manufacturing is picking up speed after the slow winter. Manufacturing is a significant component of the economy and strong gains should add to GDP growth this quarter. Motor vehicle sales rise. Auto sales surged last month, rising 11%, confirming that cold winter weather was the main factor in weak demand early this year. Despite issues with recalls on some brands, several automakers logged double-digit monthly sales growth.